The left hinge on my old-school laptop gave way a few months ago, and it was going to be another custom job to get it fixed again. The breakage occurred during that whole PhD thing so I had just kept on putting off the repairs - until I chewed up a few hours of Dad's time last weekend to get another part manufactured. Since we'd made the part previously, we didn't have to spend long measuring the size of the aluminum brackets that we'd have to cut and shape, and were able to knock up a new (and stronger) part relatively quickly. Now the laptop rides on the bus with me every day, where I can sit and tweak the stack of papers I still have left over from my PhD to get published. Huzzah! Beryl is very, very shiny. Its fast, and the tilable windows are actually really useful on a small screen. I play with the spinny cube thing on the bus, and it makes the other passengers nauseous. Yes, that includes you, random bus traveller, reading over my shoulder. Go back to reading MX or something. So I was doing my usual rounds of aimless web surfing the a few weeks ago, and I came across the unusual photography of one Olivo Barbieri. This particular gentleman likes to hang out of the side of helicopters with his funky tilt-shift lens and take photographs of landmarks to make them look like little train-set sized miniatures. To acquire the right kind of photo to 'tilt-shift' (try saying that ten times quickly), it helps if you are high-up looking down. The above photo was originally taken by Briony when we were coming in to Sydney (from Melbourne) to land. 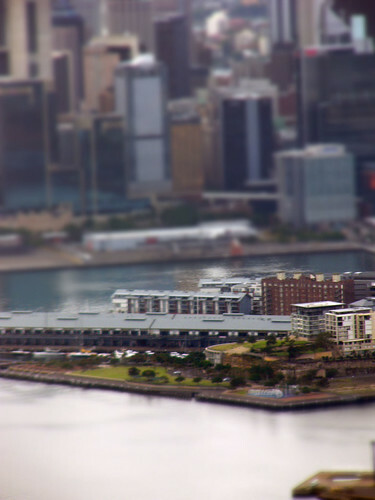 I ran it through the tilt-shifting process (just a bit of masking and blurring), leading to more-or-less instant miniaturisation of good ole Sydney. 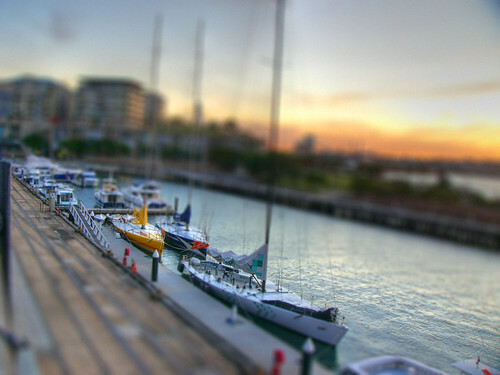 I took the above photo from the back porch at work, and again tilt-shifted it. There's a giant, enormous flickr group dedicated to faking the tilt-shift effect - it's worth a browse to see some really peculiar photos. The Easter weekend was spent in Melbourne, where Kavitha kindly put us up in her new place in sunny Auburn. Briony has already covered the weekend in some detail, so I'll just add a few scrappy bits of commentary. Melbourne itself looks and feels a lot more like a European city. Looking out over the rooftops, you wouldn't be hard-pressed to imagine it looked a bit like London. That said, the centre of the city is pretty cosmopolitan. The Eureka tower, dominating the Melbourne skyline, bears more than a passing resemblance to the Half-Life 2 citadel. Woo, spooky. Something which did surprise me was the National Gallery of Victoria. Sitting somewhere in-between a museum and an art-gallery, it was pretty accessible (even the modern art), and the free entry helped too. This means I'll be getting up off my rear and visiting a few galleries here, too. I think I'll start with the MCA - it's open late on Wednesday nights, so that'll be a good time to take a wander through. 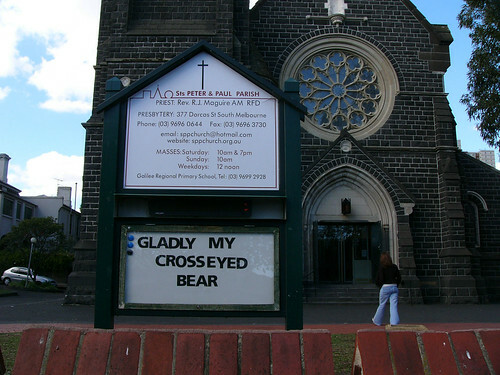 I'll accompany Briony along to the occasional Church service (trying to learn a bit more about what it's all about, that sort of thing), and the Easter service at Sts Peter and Paul in South Melbourne with Father Bob was an education unto itself. Fr. Bob is very much more a caricature of himself in real-life than what you see on the TV or hear on the radio.